‘This the season! 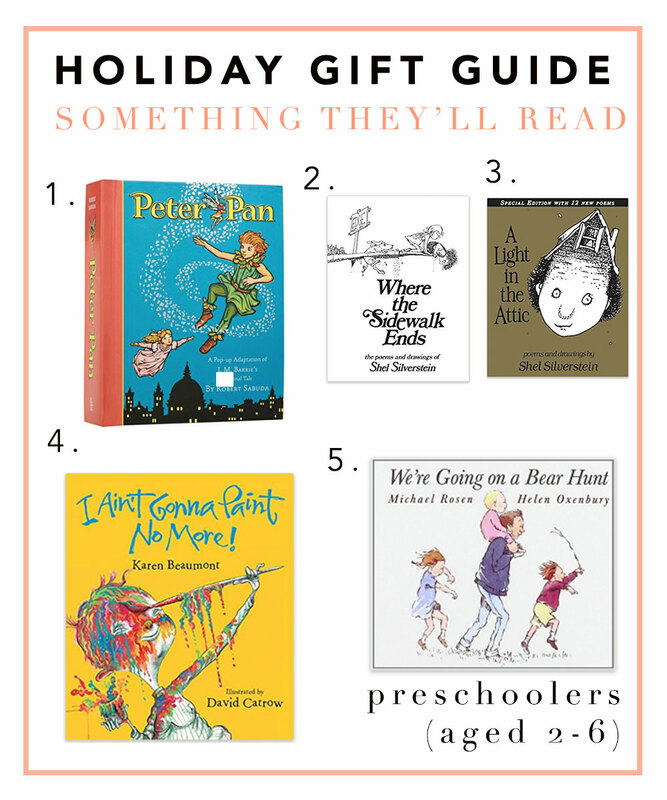 Holiday Gift Giving is upon us. 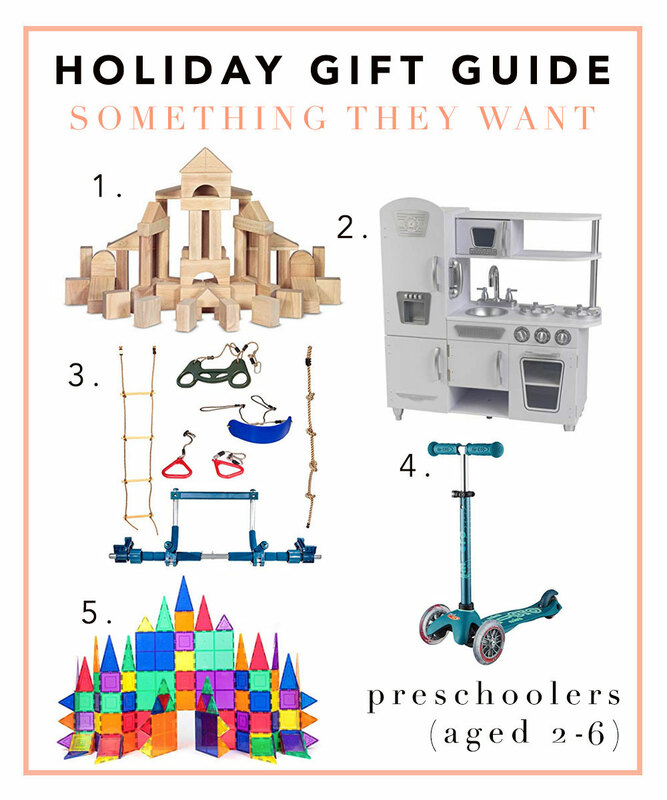 We’ve rounded up our favorite toys for preschoolers aged 2-6 to make shopping a little easier. See something we missed? Let us know in the comments! 1.) Melissa + Doug Solid Wood Building Blocks - My kids love these, and I love how simple they are. 2.) KidKraft Vintage Kitchen - couple with Melissa and Doug Food Groups - We are partial to the IKEA kitchen, but this Amazon Prime-able kitchen is just as cute! We also love the Melissa + Doug food toys to go with it. 3.) Gorilla Gym - Stephanie swears by these, and I’ve become a believer! 4.) Micro Kickboard Scooters - My kids’ favorite toy, hands down. Couple with this helmet. 5.) Picasso Tiles (100 Pieces) - like MagnaTiles, but more affordable! 1.) Boon Silicone Stretchy Lids - I always keep a few of these in my purse, just in case we visit a spot that doesn’t have a lid option for cups. They also have a straw version - they easily fit over almost any cup and are easy to wash! 2.) Kitchen Helper Stool - My kids love to cook and “wash dishes” — they also love to fall backwards off of the stools I set up for them. This option is a bit more kid-friendly and folds easily! 3.) Dustbuster - Why get my kid a mini Dyson when they can have a good ‘ol fashioned Dustbuster? They love this chore and actually clean up after themselves. It’s a Christmas Miracle! 4.) Automatic Toothpaste Dispenser - I don’t know about you, but any excitement I have about my kids brushing their own teeth is quickly ruined by seeing an explosion of toothpaste in the sink. This toothpaste holder and dispenser is the perfect alternative. 5.) Monster Sleeping Bag - Perfect for nights at Grandma’s or a slumber party in the den floor! We love these monster sleeping bags. 1.) Peter Pan Pop-Up Book - My kids love any pop-up book, and this one is a family favorite. 2.) A Light in The Attic - Shel Silverstein for the win! Each of my kiddos gets to pick one poem out to read before bed. 3. )Where the Sidewalk Ends - Same as above! 4.) Ain’t Gonna Paint No More - Don’t mind the grammar - this book is a winner. 5.) Going on a Bear Hunt - Interactive and sing-song, this is a favorite.